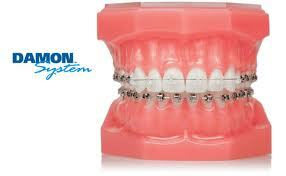 Damon braces are a modern orthodontic appliance used to straighten teeth. They consist of high technology metal or ceramic brackets and an archwire, similar to conventional braces, but lighter. The Damon system uses state of the art low-friction technology to allow movement of teeth quickly but gently, allowing you to achieve your perfect smile painlessly. Healthy teeth are extracted only on rare occasion, and the clinically proven treatment approach will provide a fuller natural facial profile without need for palatal expanders. When commencing your treatment with Damon braces, the dentist will take an impression of your mouth and send it to the laboratory. The Damon brackets are manufactured to your teeth which ensure optimum results are achieved at the end of treatment. Once the Damon brackets are made, each bracket is bonded to the teeth with a dental bond whilst maintaining strict moisture control. After having the braces fitted, you will be asked to come back every few weeks for the dentist to review and adjust the appliance. Will I need to have teeth extracted to have damon braces? With Damon Braces, it is unlikely that we will need to extract teeth to create space, thanks to the way the system uses biologically sensible forces that work with the body’s natural adaptive processes. This achieves a broader, natural profile. In a few cases however, there may be a need to extract teeth to create enough space. This will be performed with consideration of facial balance and profile. Price of Damon Braces depends on complexity and length of treatment, but on average treatment will cost around £3600. At Smile Cliniq, we offer an option to help with the process of paying for treatment, where patients can take out a loan and spread the cost over 6 months interest free. To find out more about the payment option, call us on 020 8090 9077 or ask the dentist during a consultation appointment. Below is a table showing a brief comparison between having treatment with Damon Braces and Invisalign clear braces. Perfect result always achievable? Yes Usually in mild – moderate cases, but difficult for severe crowding. May require refinement aligners near end of treatment. Damon braces are a very good option for those who require significant amount of movement to straighten their teeth, but who wish to have treatment completed quickly with minimal aesthetic impact, pain and discomfort. Damon braces are a way to straighten your teeth comfortably and cosmetically. We are able to provide damon braces in London at a reasonable cost carried out by well qualified dentists. Damon braces are an up and coming treatment for malocclusion and crooked teeth. Dentists at Smile Cliniq dental practice in London will be sure to give you straighter teeth with this new and innovative Damon brace system. Any braces, aligners and other oral devices take time to get used to. Initially, it feels uncomfortable, with hyper- or hypo- salivation common, and a small lisp can be present, this usually disappears after a few days.